Built by Franciscans to house the tomb of Saint Anthony of Padua, the order's second saint after their founder, this church became their second most important after the founder's church at Assisi. Anthony, born in Lisbon and baptised Fernando, was canonised by Pope Gregory IX on 30th May 1232, a year after his death and construction here began later the same year. 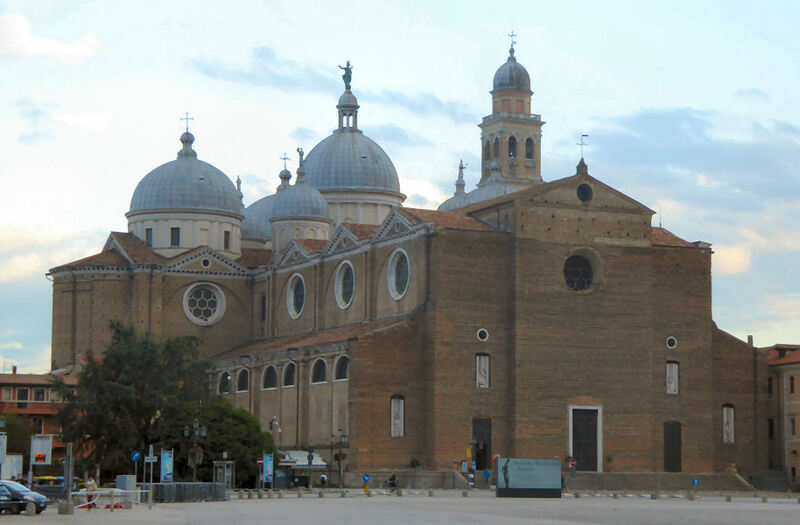 When he had fallen ill in Camposampiero, outside Padua, he had asked to be brought to Santa Maria Mater Domini to die. Dying on the way back, he had been buried in this small church which probably dated from the late 12th century. 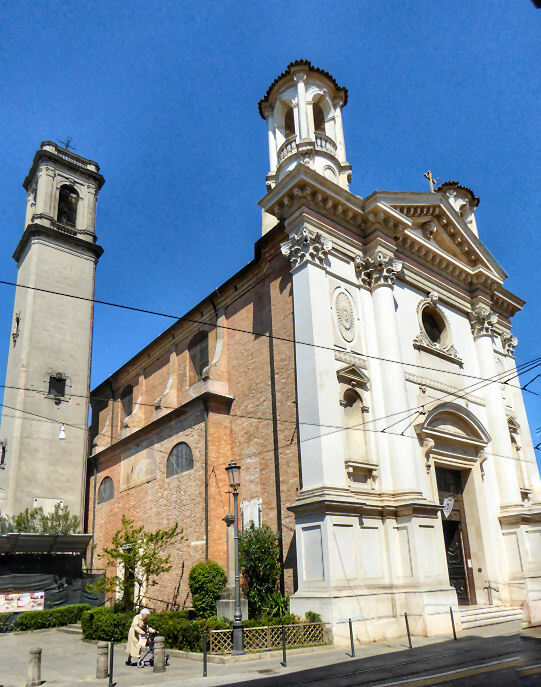 This church was incorporated into the present basilica as the Cappella della Madonna Mora (Chapel of the Dark Madonna). Work on the basilica was completed around 1350, and his body was transferred to the presbytery here on 8th April 1263, moving to its present location in 1310. There were many modifications to the church, from the rebuilding needed following the collapse of a campanile struck by lightening in April or May 1394 to the 1449 construction of the twin campanili, which left the church looking much as we see it today, with repairs following fires in 1567 and 1749. Brick with mostly gothic detailing, using white marble. The cluster of five cupolas is striking, with the central one being conical, with two towers behind and two minarets. In plan the five domes form a cross. The facade has four deeply recessed arches with the door in the middle topped by a 1940 copy by Nicola Lochoff of Mantegna's lunette fresco of 1452 of The Monogram of Christ with Saints Anthony and Bernard (see above). The original is now in the museum here. Above the lunette is a 1940 copy by Napoleone Martinuzzi of a statue of Saint Anthony, the original by Rinaldino of France, is in the museum here too. Above is a loggia of 17 columns topped by a pediment with a rose window flanked by two mullioned windows. A photograph taken before 1912. More unmixed gothic in style than the exterior. A looming wide nave is separated from its aisles by chunky square brick columns clustered around with 16th century memorials of nobles and a few fresco panels of the Madonna and Child. The first two pillars even have altars on them, facing the entrance. The one on the left has the soppy Madonna del Pilaster, a mid-14th-century fresco by Stefano da Ferrara (the saints and angels are later additions. Another side of this column has a fresco of Saint Anthony in the Walnut Tree by Pietro Annigoni. The ceiling is a sequence of domes. 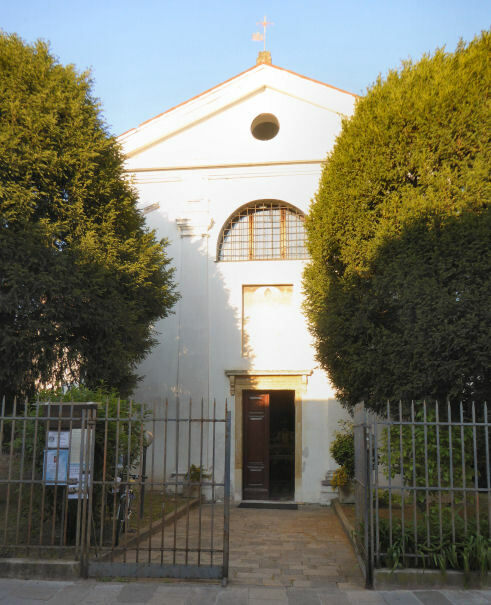 The jazzy third chapel on the right is Chapel of the Holy Sacrament (Cappella del Santissimo Sacramento, also known as Cappella Gattamelata), sometimes reserved for prayer. 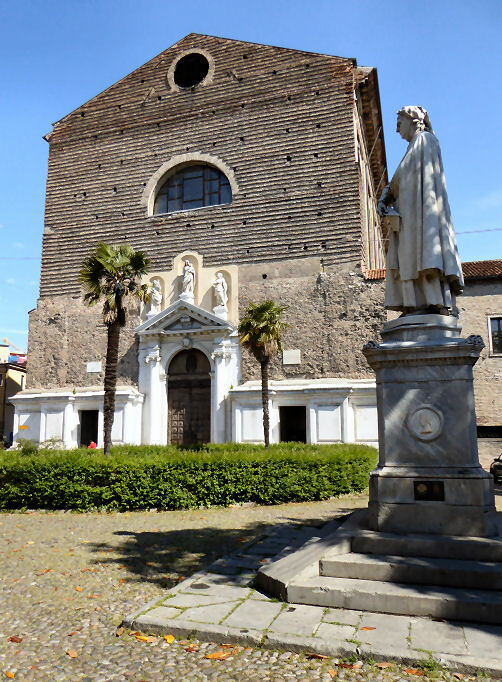 It houses the tomb of Gattamelata, whose famous equestrian statue is outside, and of his son Giannantonio. The bronze tabernacle here is by Girolamo Campagna. The arched niche behind contains a mosaic representing The Holy Spirit with rays of light descending, made by Lodovico Pogliaghi between 1927–36. The forth bay on the left has the tomb of Antonio Roselli by Pietro Lombardo made between 1464 and 1467 and said to have been inspired by the tomb of Leonardo Bruni by Bernardo Rossellino in Santa Croce in Florence. The long chancel has an ambulatory with nine radiating chapels. Donatello's bronze Crucifix, which commission brought him to Padua in 1443, along with the statues of the Madonna and Child, six saints and four bronze reliefs showing episodes from the Life of Saint Anthony, which were made for a high altar dismembered in 1579, are now distributed around the enclosed choir which is not freely accessible. On the right is the large Chapel of San Giacomo (San Felice) (see photo right) (this chapel seems to have its lights switched off during services). Bonifacio Lupu, a condottieri and a guelph exile from Parma, had hoped to be buried in the baptistery in Florence. When this request was refused he commissioned this chapel to be built. 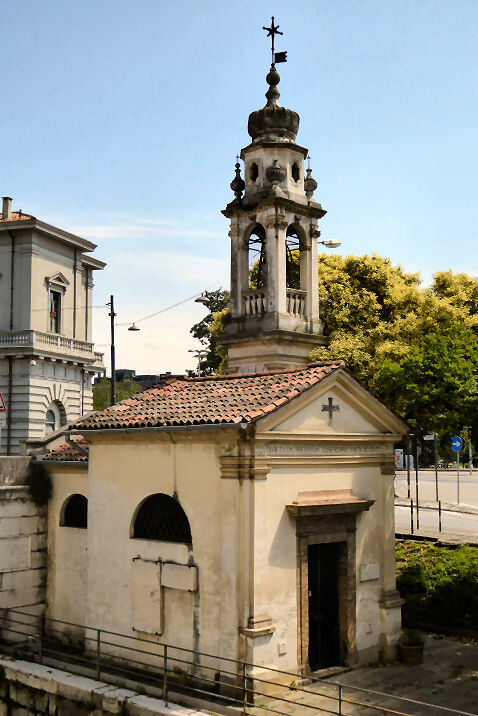 But documents recently discovered show that the chapel was initially planned as a resting place for his grandfather, Guglielmino Rossi, and his uncles Rolando, Pietro and Marsilio. The sarcophagus on the left contains their remains. 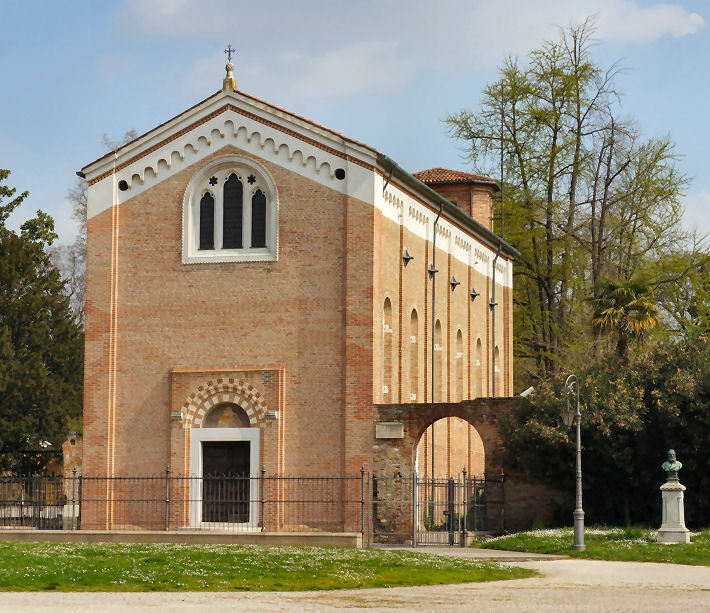 Andriolo di Santi was employed to construct a chapel imitating the then-gothic appearance of St Anthony's chapel opposite. Work began in February 1372, until December 1375 when, following Andriolo's death, the work was completed by his son. Altichiero worked on the frescoes from 1374-1378. The lower register of the back wall is dedicated to the Life of Christ, with the Crucifixion in the centre, the Annunciation in spandrels in the far corners, and the Entombment and Resurrection in lunettes above the two flanking tombs. Saints with Franciscan and Paduan connections are depicted in eight medallions in spandrels on the back wall and on the inner façade. Doubts as to how much of the work here and in the Oratorio di San Giorgio was actually done by Altichiero himself have been expressed. That these works were made in collaboration with fellow Veronese Jacopo D’Avanzi is mostly accepted, but the division between them is constantly argued. The most recent scholarship gives them to Altichiero solely, but with a different hand detected, especially in the lunettes. Scenes from the life of St James of Compostella take up the rest of chapel, beginning in the upper lunettes on the east wall and wrapping around the west and south walls to end beneath their starting point on the lower tier. The choice of scenes is a little eccentric, with the family thought to be responsible for choosing episodes from the saint's life involving his persecution by the wicked Queen Lupa, who later converted and had her palace converted into a church. The similarity between her name and theirs is thus celebrated, along with her and they having endowing foundations dedicated to St James. Portraits of family members, their allies, such as the ruling Carrara family, and friends like Petrarch and Lombardo della Seta, his secretary, appear in some scenes too. There are also many representation of wolves (lupi) to be found around - on the façade, the tomb, the ceiling, the two lecterns and on the celebrant's vestments. An altar here, dating to 1503, contained relics of Saint Felix, giving the chapel its earlier name, until it was demolished in 1966. Opposite is what might be described as the spiritual heart of the basilica - St Anthony's Chapel. The saint's body was moved often, from it's original resting place in Santa Maria Mater Domini, which became the Cappella della Madonna Mora, then during the various stages of rebuilding was moved to the high altar, possibly, and to a marble sarcophagus on columns, and finally to this chapel in the north transept in 1350. It is not known why it was decided to make the tomb accessible to all, and not buried in a crypt visitable only by a select few, as at Assisi. On April 8th 1263 the tomb was opened in the presence of Saint Bonaventura. His body had decomposed but Anthony's tongue was found to be intact, 'rubicond and beautiful', and so the miraculously preserved organ was removed and placed in a reliquary still kept in the reliquary chapel here. 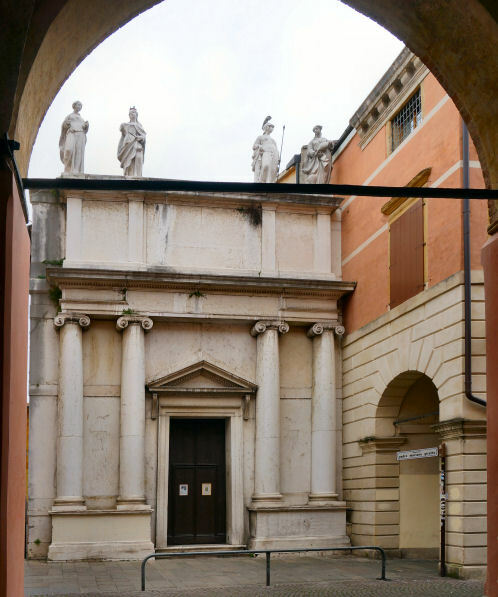 The original gothic chapel was completely rebuilt in renaissance style in the 16th century, it's screen of red marble columns now to be found supporting the portico of the church of Santa Maria dei Servi. The previous structure is said to have been similar to the chapel of San Giacomo opposite, with a five-bay arcade with statues in niches above. It had a now-lost fresco cycle attributed to Stefano da Ferrara depicting, amongst other things, four miracles and the death of St Anthony. There are now bas-reliefs of the life of the saint by Antonio Minello, Jacopo Sansovino (Resurrection of a drowned girl and Saint Anthony resuscitates a drowned boy), Tulio Lombardo (The Miracle of the Usurer and Saint Anthony reattaches the foot of a young man.) These four are the 4th to 7th of the panels. The 9th is Saint Anthony makes the newborn baby speak in order to attest his mother's honesty by Antonio Lombardo, the brother of Tulio. Through an arch to the right of Saint Anthony's chapel is the Cappella della Madonna Mora, all that remains of the earlier church of Santa Maria Mater Domini. It is so named because the statue above the altar is of the Madonna with dark hair. It is the work of by Rinaldino di Puy-l'Evéque and dates from 1396. Rinaldino also being responsible for the Saint Anthony over the Santo's door. Behind the statue is a fresco by a 'disciple' of Altichiero. Frescoes here include a very damaged Jesus Leaving his Mother by Giusto de Menabuoi. The chapels in the ambulatory are all frescoed, mostly in the early 20th century, the third and fourth on the left and second and third on the right in imitation gothic style. Through an arch in the centre of the ambulatory is the 17th century reliquary chapel, designed by Filippo Parodi, a pupil of Bernini, on the site of a chapel dedicated to Saint Francis. It has the Saint Anthony chin reliquary as well as the better-known tongue one. A finger and some hair is to be found here too, along with a habit, parchments and coffins. It is not for the faint-hearted or the baroque-averse. The first chapel on the right in the ambulatory, just past the entrance to the sacristy, has three paintings by Pietro Annigoni inside, and frescoes in the underside of the arch of eight saints attributed to Giotto, or at least his workshop. They have been much repainted, especially the faces. 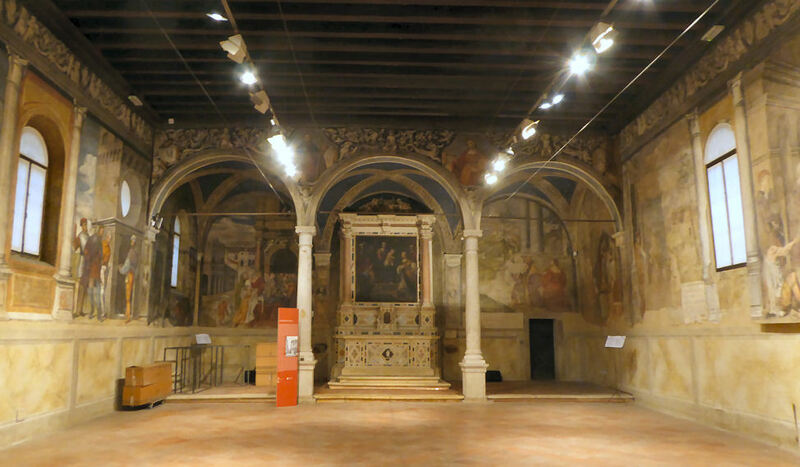 This chapel may originally have belonged to the Scrovegni family, which makes for a connection to Giotto's Arena Chapel commission. The chapter house, beyond the sacristy through the door to the right of this last chapel, has fragmentary frescoes also attributed to Giotto, at least partially, found under plaster and whitewash in the mid-19th and early 20th centuries. They depict Saints and Prophets in fictive niches, part of a Crucifixion and a Stigmatization of Saint Francis. 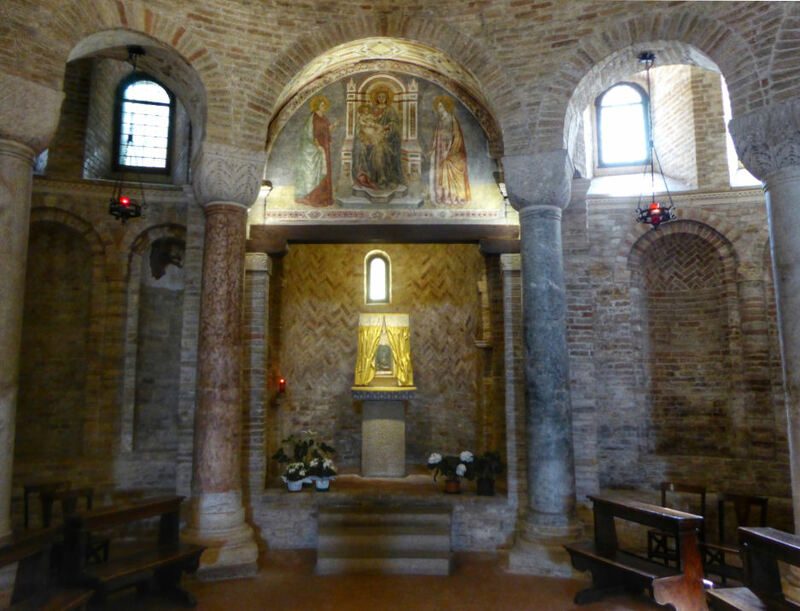 It is thought that, having been brought here by the Franciscans after his work at Assisi, it was whilst working here that he met Enrico Scrovegni, which led to his commission to decorate Scrovegni's Arena Chapel. To the right of the sacristy door is the short passageway between the church and the Cloister of the Magnolias. 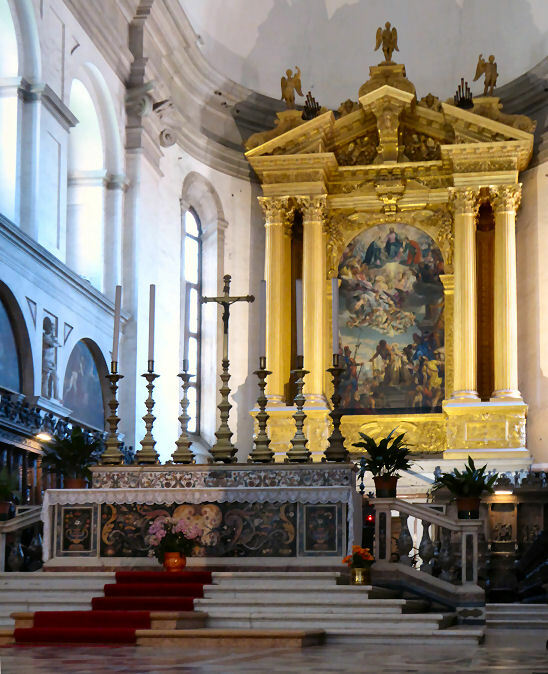 It has, on the left, the tomb of Federico Lavellongo, with sculpture by Giovanni de Santi and a fresco in the lunette of The Virgin and Saints Worshipped by Lavallongo attributed to Altichiero. Opposite is a tomb with a fresco of the Coronation of the Virgin by Giusto de'Menabuoi (see photo right). A panel from a predella depicting The Descent of Christ into Limbo by Jacapo Bellini is, it has been suggested, from the predella of an altarpiece that was in the Gattamelata Chapel here, signed by Jacopo along with his sons Gentile and Giovanni in 1459 or 1460. It is now in the Eremitani Civic Museum. There are other panels in Ferrara (an Adoration of the Magi possibly by Giovanni) and the Correr in Venice (a Crucifixion). Saints Anthony Abbot and Bernardino in Washington may also be from the same predella. In the cloister of the Blessed Luca Belludi. Contents include the lunette fresco by Mantegna for the Basilica’s doorway and 18th century altarpieces, mostly martyrdoms, by Giacomo Ceruti, Giambattista Tiepolo, Antonio Ballestra, Giambattista Pittoni, Pietro Antonio Rotari, Giovanni Antonio Pellegrini, and Giambattista Piazzetta painted for the ambulatory chapels. It begins with a bewildering maze of glass cases containing votive plaques and offerings and too much weird stuff for a non-believer to comprehend. This is followed by a permanent exhibition called ‘Donatello in the Basilica’ established in 2015. It has photos, plaster casts and information panels about the works Donatello made for the Santo, but which they won't let you get close enough to admire in the church. But it's in the un-signposted-to upstairs gallery that the good stuff is displayed. There are sweet fresco fragments, including the lunette and altarpieces just mentioned. Also a Carpaccio Madonna and Saints altarpiece on long-time loan. Painted for the convent of San Francesco di Pirano, it was looted by the Nazis and eventually returned here. The Santo website says that the original altar that it was taken from has been readied for its return since at least 2000. A Titian sinopia from the scuola next door is so faint as to defy comprehension. There are robes and silver stuff here too. 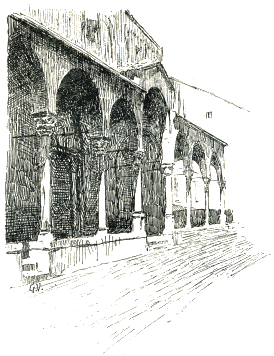 The Courtyard in front of the church, which was once used as a cemetery, contains Donatello's famous bronze equestrian statue of 1447-50 of Erasmo da Narni, known as Gattamelata (the honeyed cat, sometimes interpreted as calico cat or speckled cat) the Venetian condottiere who later became a podesta in Padua. The nickname is said to derive from his mother's name, she being called Melania Gattelli). It was commissioned by Gattamelata's wife, Giacoma da Leonessa, and is famed as the first equestrian statue cast in bronze in Italy since Roman times. The tall plinth, also the work of Donatello, has two doors, one open and one ajar, symbolic of the doors to the underworld. Above are two reliefs, on one there are two putti pointing to the coat of arms of the deceased, on the other two angels with armour. The badly weathered originals are now in the Santo Museum, having been replaced with copies in the 19th century. The Oratory is an aisleless small space, plainly wood panelled below and gorgeously frescoed above. (see below) It's a feast of Altichiero, and Jacopo D'Avanzo, with scenes from the Lives of Saints George, Lucy and Catherine. Also four scenes from The Early Life of Christ an Annunciation and a votive fresco featuring the commissioning Lupi family. The Crucifixion scene behind the altar has the artist's characteristic horse bottoms and pony tails, with some very Giotto-like expressions and angels, and a Coronation above. The entrance wall has an Annunciation, two Adorations, the flight into Egypt and the Presentation. The left hand wall is the life of St George, the right-hand Saint Catherine above and Saint Lucy below. The ceiling roundels have the four evangelists over the altar. The frescoes were covered in whitewash until 1837. 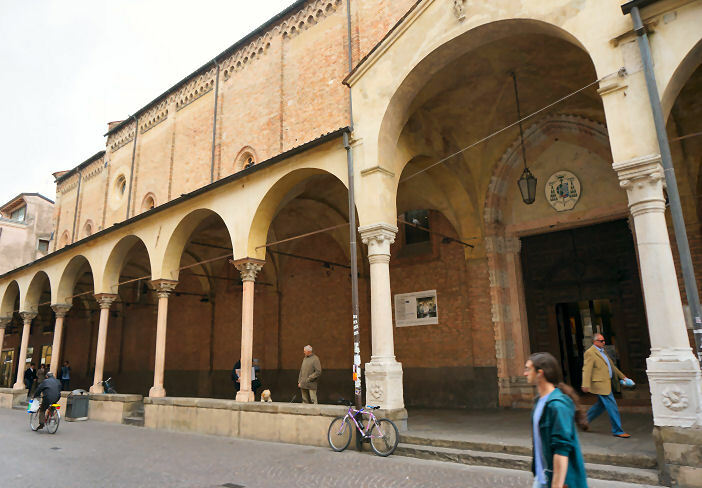 The Scuola is the home of the Brothers of Saint Anthony, founded just after the saint's death and still active. 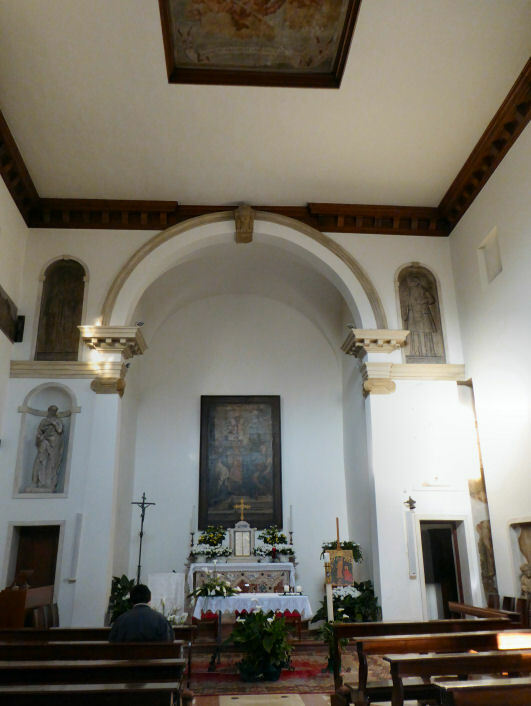 The small church downstairs has a high alter taken from the demolished church of San Biagio, above which is a Madonna and Child with Saints Benedict and Jerome by Padovanino. The meeting room upstars has frescos of the life of Saint Anthony (see below) with three works by Titian, executed in 1510/11 when he was barely more than 20 years old which are his earliest documented works to survive. The show Saint Anthony granting speech to a newborn child, healing a youth who had cut off his own foot and restoring to life a wife killed by her jealous husband. There are thirteen more frescoes showing more miracles of Saint Anthony by the likes of Domenico Campagnola, Bartolomeo Montagna and Titian's brother Francesco Vecellio. The small grisaille panel at ground level behind glass is a controversial attribution to Titian. Rebuilt in the 13th century and at the end of the 17th. Contains the tombs of the composer Giuseppe Tartini and his wife to the right of the baroque high altar. Is now sometimes used for concerts, thanks to the Tartini connection. A chapel on the site, next to a leper hospital, is documented in 1181. It became a parish church in 1308, and in 1606passed to the Somascan Fathers, who established a school here. 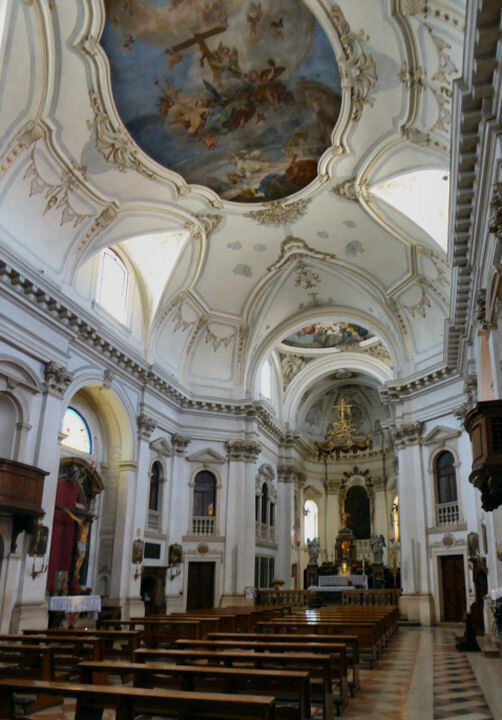 The present Rococo church was built to plans by a lay brother of the order called Francesco Vecelli with work beginning in 1737 and completed in 1749. The façade was designed by the Paduan architect Girolamo Frigimelica. With the Napoleonic suppressions the Somaschi were expelled and the church passed to secular clergy. Aisleless with two shallow chapels each side, the first two at the back with painted altarpieces by Mariotto - has has four works in here, including a panel on the wall of the apse. Two chapels have statues - a Madonna and a Crucifix. The deep apse-ended choir rather concentrates the lighter baroqueness of the rest of the church. The central ceiling panel is by Nicolò Baldassini and shows the Exaltation of the Cross. 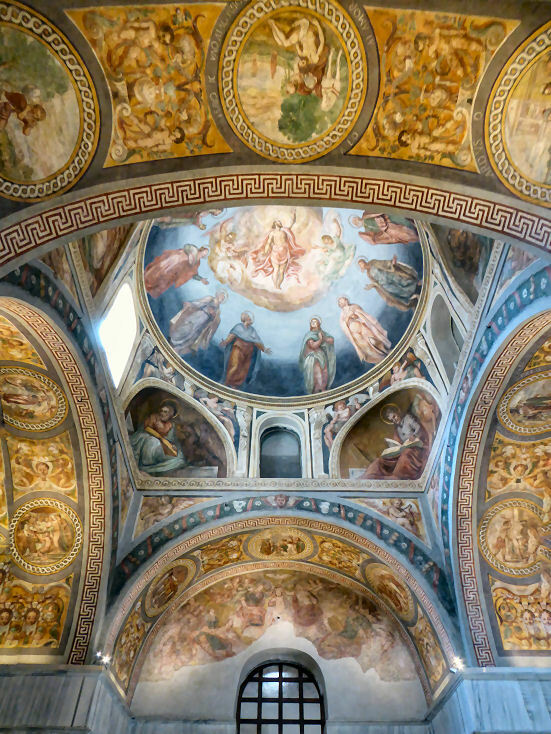 Baldassini also frescoed the cupola. Through a door on the right you enter the Cappella della Madonna della Neve and an oratory called the Sala del Redentore. The oratory dates to the 15th century and was the home of the former Confraternity of the Corpo di Cristo di Santa Croce. In 1810 the oratory passed to the parish and over the years has seen use as a storage room, a theatre, an army meeting hall - in 1917 - a band room, a cinema and a furniture workshop. Only in 1976 did it see restoration work, followed in 1995 by the restoration of the frescoes. It is said that in 304 Justina, a 16 year-old Paduan of noble birth, was martyred with a sword and that over her tomb here, in an Early Christian cemetery, a small Basilica was built in the early 5th century and enlarged around 520. It became a Benedictine abbey in the 8th century using funds, it is said, provided by the invading Lombard kings Liutprando and Ildebrando. 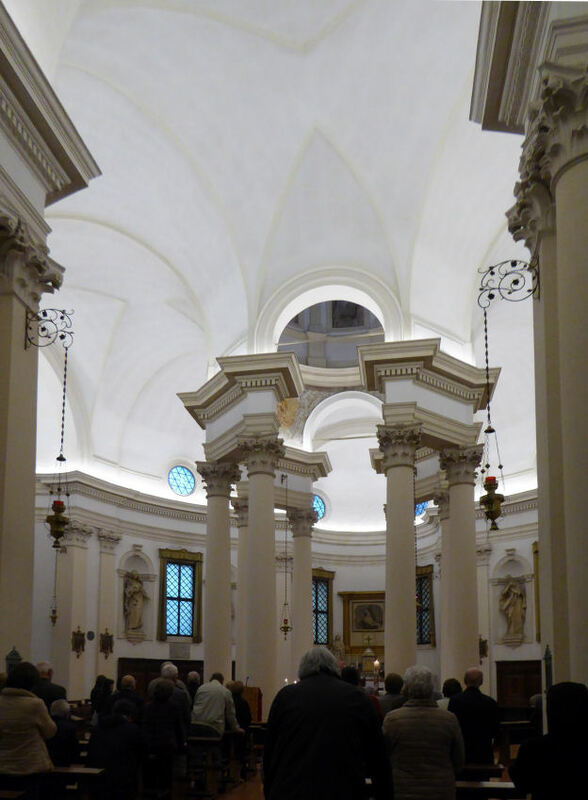 More rebuilding from 1117, after the same earthquake that did for many of Padua's churches. After two more rebuildings came the church's current form, which dates from 1529-79 with Girolamo da Brescia, Andrea Moroni and Andrea da Valle as successive architects. Said to be the 11th (or 9th) largest Christian church in the world. The Benedictine monastery and church was suppressed by Napoleon in 1810, and suffered much through its use from 1816 as a barracks by the Austrian army, but the church reopened and a monastery was re-established here in 1919. This now houses a library and book-restoration centre. Bare brick and huge - larger than the Santo, which seems to have inspired its form, especially the four large and four small domes. 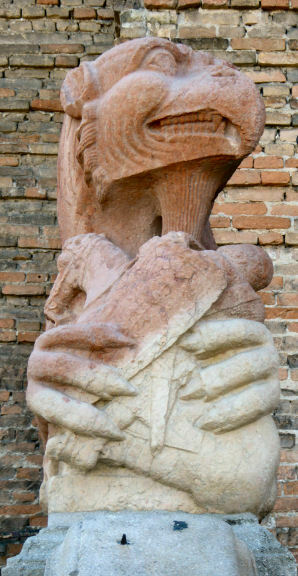 Two 14th century Veronese rosso e grigio marble gryphons (see right) at each end of the entrance staircase, were taken from the protiro of the medieval church. Big and renaissance, with very chunky pillars. Six deep flat-backed chapels in three bays down each side of the nave with three shallow cupolas over the nave corresponding with each bay. The first five chapels each side have matching marble altars with unspectacular 17th century altarpieces by the likes of Loth, Luca Giordano, Sebastiano Ricci, and a pair of Scuola del Veronese in the first facing pair. The fifth on the right is the best lit with Palma Giovane's Saint Benedict receives Saints Maurus and Placidus. There are also works by Bissoni and Balestra. Then there's a pair of longer apse-ended chapels with sculpture-topped altars. The huge transept has apse-shaped ends too with more modest altars. There's than another pair of apse-ended chapels with matching sculptural altars, then two more deep chapels flank the choir. All of these chapels are lacking in painted decoration. There are staircases down to a crypt either side of the stairs up to the choir. Over the high altar, far off at the end of the choir, is Veronese's crowded masterpiece The Martyrdom of Santa Giustina of 1574/5, which has the church in the left background. It features, according to Pignatti, 'a flight, nothing less than irritating, of too many angels.' The (roped-off) choir also has carved walnut choir stalls of deserved fame by Riccardo Taurigny from 1558/66, and the remains of the saint herself under the high altar. The chapel right of choir has a very agitated Pieta of 1689 by Filippo Parodi, who is said to have brought the style of his teacher Bernini to Padua and was responsible for the very baroque reliquary chapel in the Santo. The chapel to the left of the choir has a frescoed ceiling by Sebastiano Ricci, the only frescoing in the main church, with some nice trompe l'oeil effects. 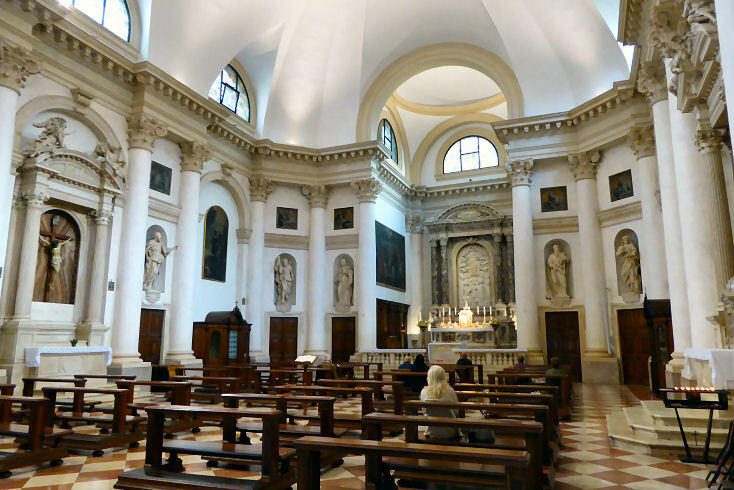 The left hand transept is the Chapel of Saint Luke with his remains and an icon of the Madonna and Child, along with works on the walls by Balestra and Galvani. Through the right-hand transept, with its pair of huge canvases, one each by Bissoni and Balestra, behind the small altar, there is the suddenly very decorated Corridor of the Martyrs, named for the Martyr's bones found down a well here. It was built to link the church with the chapel of St Prosdocimus after the old chapel was destroyed by an earthquake in 1117. Facing you before you turn left at the end is The Blessed Giacoma Discovers the Well of the Martyrs by Pietro Damini. Turning left you enter the corridor where access to the subterranean passages containing the relics, amongst them bits of Saints Luke and Matthew, is gained through a trap-door to the right. You then come to the Sacellum di Santa Maria e San Prosdocimo (see two photos below right) all that remains of the original basilica. Here, under the window, is the tomb of Saint Prosdocimus who was the first bishop of Padua in the 4th century, when the church was founded. The Saint Luke Polyptych, the earliest surviving altarpiece by Andrea Mantegna, painted in 1454 for the chapel of San Luca (the left transept) here, is now in the Brera in Milan. It's big and special, with two rows of saints in arched panels in traditional gothic style, and you can get up close and fully appreciate. It was looted from the abbot's private rooms by the French in 1797. 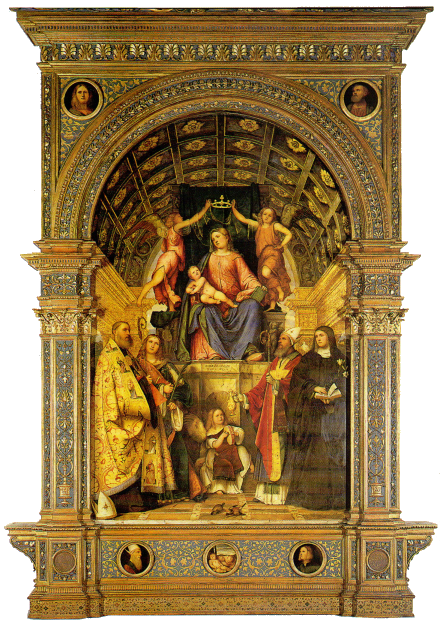 Girolamo da Romano (called Romanino)'s huge, impressive and very Venetian early-16th century Madonna Enthroned with Saints Benedict, Justina, Prosdocimo and Scholastica (see right) is now in the Eremitani Civic Museum. As is his panel depicting the Last Supper painted for the refectory here. Also there is the equally early-16th century Venetian-looking Madonna and Child Enthroned with Saints Benedict and Justina by Giampietro Silvio. Also a Deposition by the same artist. The Martyrdom of Saint Justina of 1556 by Paolo Veronese, which hung here over the Abbot’s private altar in his study is now in the Eremitani Civic Museum. Also by Veronese is a Crucifixion, painted on paragone, a dark stone, now in the Eremitani Civic Museum. A large detached fresco panel of The Deposition, with roundels depicting saints, probably of 1515/20 by Girolamo Tessari (called Dal Santo) is in the Eremitani Civic Museum. Benedetto Bordon (c.1455-1530) was commissioned in 1523 to decorate an Evangeliary (Gospel Book) and an Epistles for the monastery here. These manuscripts are in the Chester Beatty Library in Dublin and the British Library respectively. An initial showing The Resurrection (MS Marlay 18i) cut from an Antiphoner (choir book) which is part of a multi-volume set still to be found in Santa Giustina, is now in the Fitzwilliam Museum in Cambridge. The lower part is the original tower. By 1599 the church had grown such that the bells could not be heard, it is said, so the height was doubled. Elena Cornaro Piscopia, the celebrated scholar and the first woman to receive a university degree, was buried here in 1684. She eventually earned a philosophy doctorate. Her first choice of subject had been theology but Gregorio Cardinal Barbarigo, the Bishop of Padua, had forbidden this course as she was a woman. Prato della Valle, with Santa Giustina and the monastery of the Benedictine nuns is a painting of c.1756 by Canaletto, of which several versions exist, including a good one - and the only one that's signed - in the Museo Poldi Pezzoli in Milan. It shows the Prato della Valle before the landscaping and canal building - it's just a field. 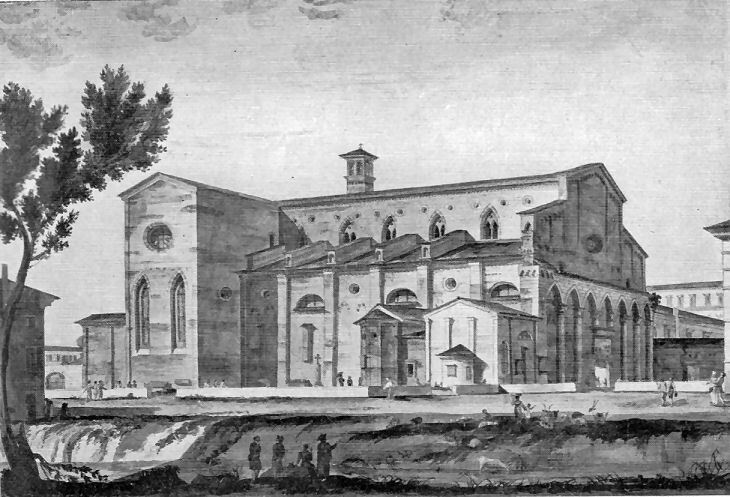 A 1766 project for the facade of Santa Giustina by Francesco Maria Preti. A church was on this site in the 10th century, it is said, but the current church dates to rebuilding in the 18th century. A not very long - almost square - nave, with an altar and two confessionals each side, a square choir, stone saints in niches and long canvases in the choir of the Resurrection and ?Saint Lucy. Is said to have a painting of Saint Luke as a painter, attributed to Giambattista Tiepolo, but this was not to be seen. Benedetto Diana's Virgin and Child with Saints, now in the Accademia in Venice. A carved lunette of the Madonna and Child by the studio of Pietro Lombardo is in the Eremitani Civic Museum. Next door to Santa Lucia, built from 1525 to 1542 on the site of a building bought for the Confraternity of Saint Roch in 1476. Acquired by the City of Padua in 1925 and restored 1926-29. More restoration work in 1950, when the frescoes on the right wall, more damaged than those on the left, where detached, cleaned and returned. More work in the 1960, 1970s and 1993. 16th century frescoes cover all four walls of the meeting hall on the ground floor (see below centre). A monochrome freeze below the ceiling is supported by false columns which divide the walls frescoed panels - two flanking the altar, two on the entrance wall, and five on each side wall. These show scenes from the life of the saint, beginning to the right of the altar. The first The Parents of Saint Roch in Prayer, is by Domenico Campagnola. The Birth of Saint Roch follows, by Girolamo Tessari (called 'dal Santo') . The next two are The Death of the Father of Saint Roch and The Distribution of His Worldly Goods by Saint Roch. These two are by Domenico Campagnola, with help from Gualtiero Padovano. The rest are by Gualtiero Padovano on his own, except the last, The Funeral of Saint Roch, which is by Stefano dall'Azare, another painter from the workshop of Campagnola. Gualtiero's Saint Roch is Taken to Prison (see right) cunningly incorporates the real window of the oratory into the fresco. Over the altar is a Virgin and Saints Roch and Lucy panel by Alessandro Maganza from 1697. The same two saints also appearing in the spandrels above. 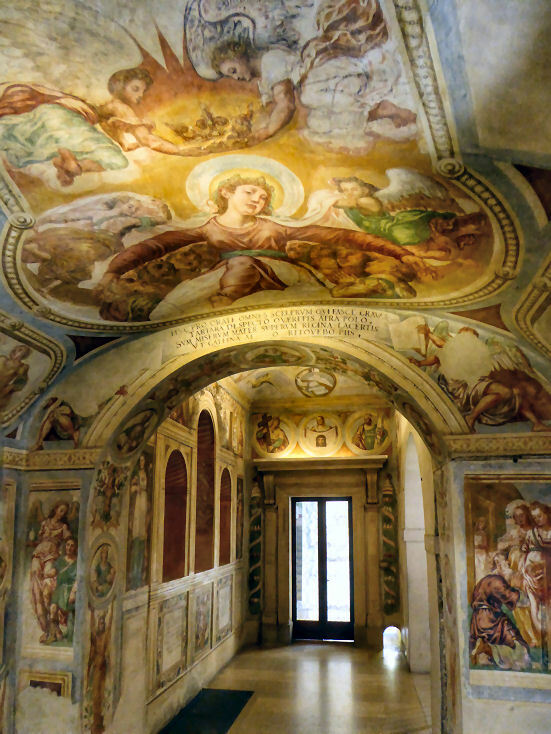 The upstairs hall is also partly frescoed - decoration began in 1559. Has a large stucco altar frontal by Tiziano Minio showing Saint Roch and Two Saints. Built over an ancient oratory c.1748. 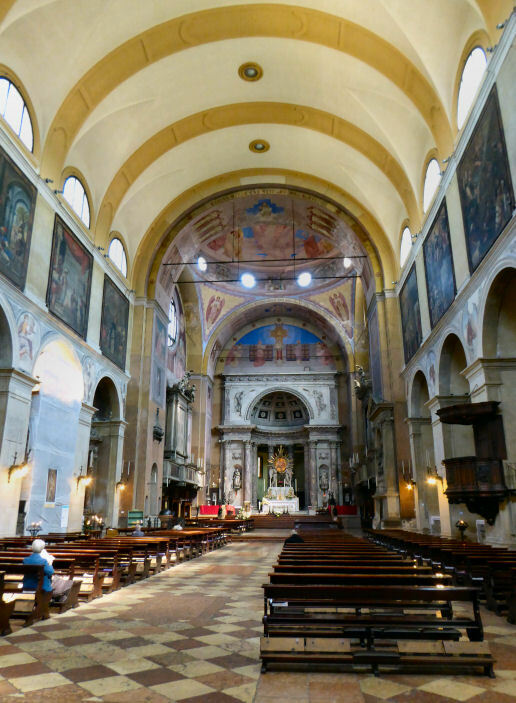 The architect was the Venetian Thomas Temanza, more famous for Venice cylindrical church of Santa Maria Maddalena (where he is buried) and San Servolo. 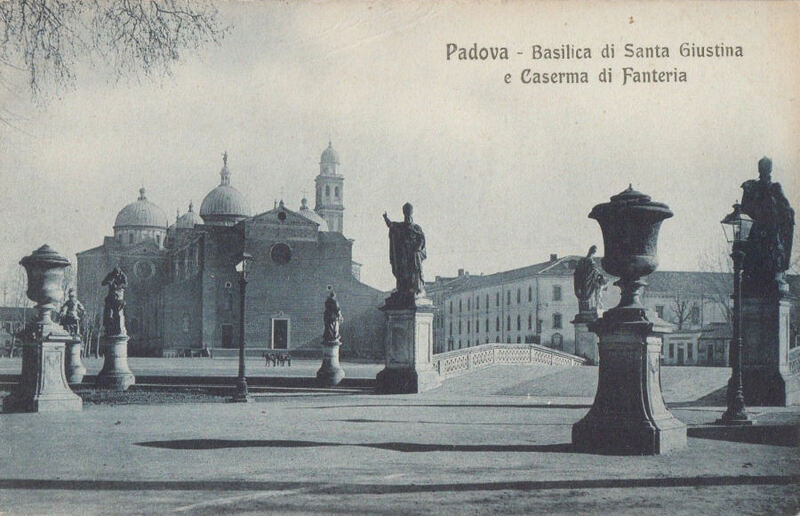 Here he provided Padua with an early example of a neo-classical façade. 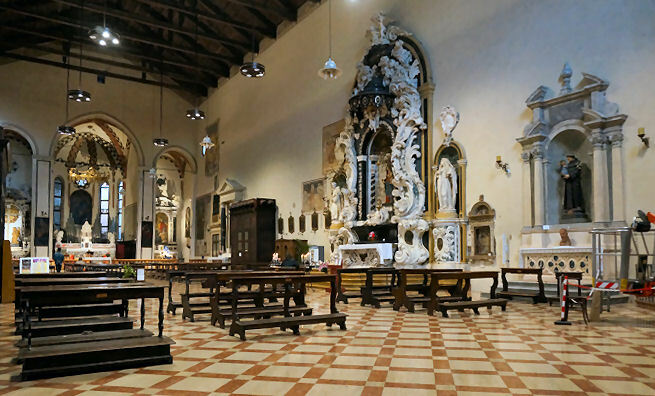 Small, box-like and serene, with a pair of side altars topped by altarpieces by Venetian painters - San Francesco di Paola by Giuseppe Nogari (a pupil of Antonio Balestra) and The Flight into Egypt by Francesco Polazzo, each flanked by life size sculpted figures of the four evangelists by Bonazza. The large ceiling panel is The Apotheosis of Saint Margaret by Giorgio Anselmi, an artist from Verona. Continuing the Venetian rococo roll of honour, the high altarpiece is The Glory of Saint Margaret by Francesco Zugno, a pupil of Giambattista Tiepolo. To the left here is The Martyrdom of Saint Margaret by A Urbani, to the right is The Sentencing of Saint Margaret by Francesco Fontebasso. Opened by volunteers from Salvalarte, who don't have a website but are a branch of Legambiente. September 2017 Not open when I visited at times when it should've been. 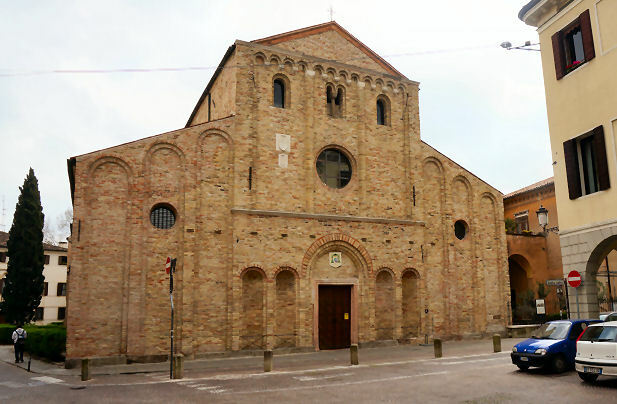 A church here dates to the 14th century, where it is said that the Colombini met, they being a group of penitents devoted to Saint Anthony of Padua who formed a confraternity. 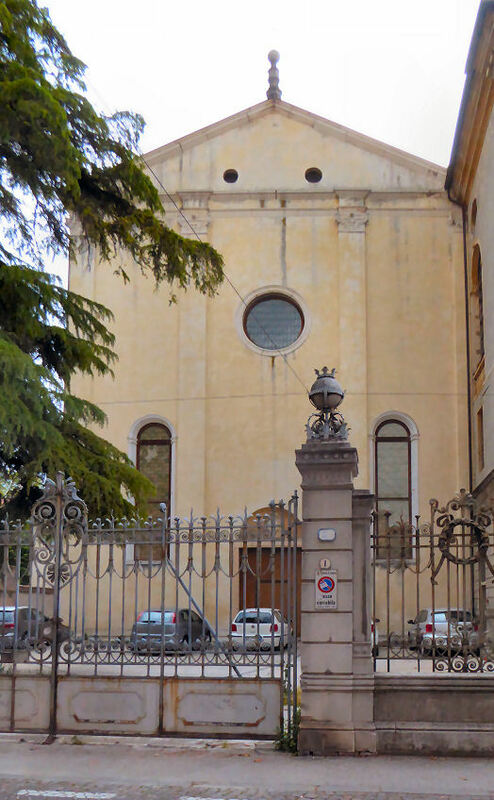 They were suppressed by Napoleon and with the oratory set for demolition it was acquired in 1810 by Conti Alessandro and Francesco Papafava de 'Carraresi, which resulted in the building as it appears now, with works of 1817. Reopened to the public in June 2017 by the Archconfraternity of St. Anthony of Padua, details here. Built from 1372, financed by Fino Buzzaccarini, the wife of Francesco I Carrara. 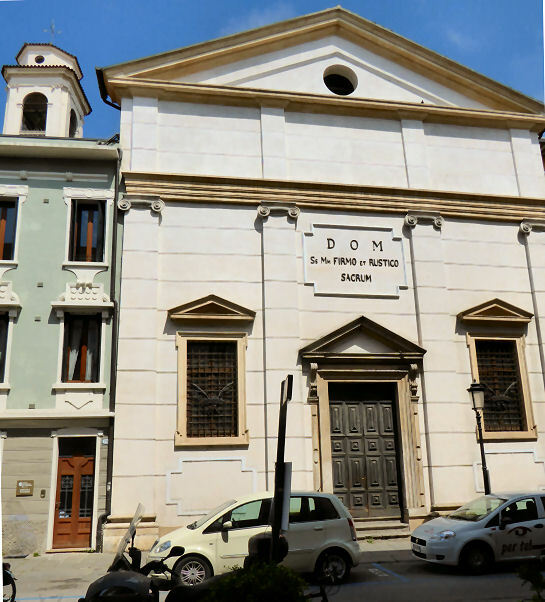 The church was built on the site of the house of Nicolò da Carrara, which was demolished. Nicolò was the banished step-brother of Francesco I and the story goes that Fina, a very pious woman, chose to build on this site to punish him for his betrayal of Francesco. Or it may have been to celebrate the marriage of her daughter. When Fina died in 1378 responsibility for completing the church passed t0 her sister Anna, the Abbess of the Convent of St. Benedict. 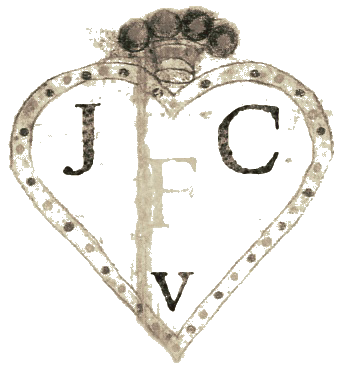 In 1393 Fina's son Francesco Novello, who had succeeded his father, entrusted the church to the Servites, which was when it acquired its current name. 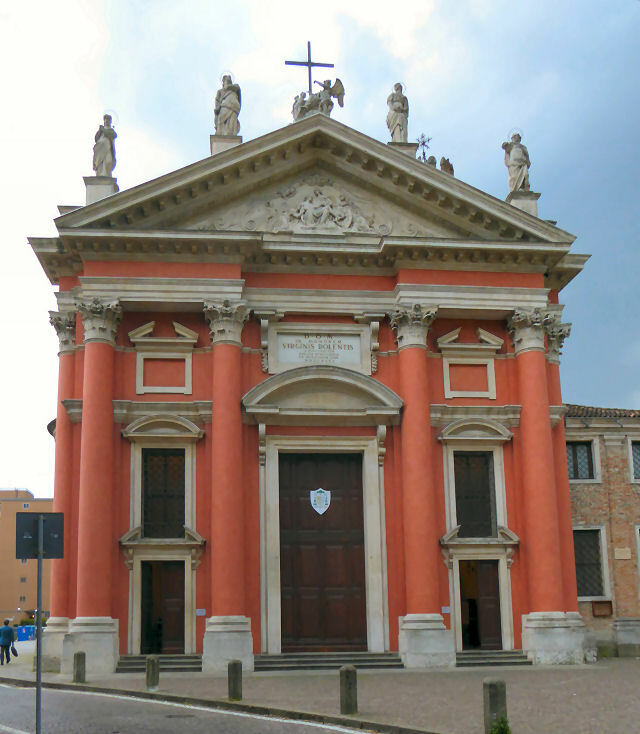 The Renaissance portico along the left side of the church was added in 1511 by Bartolomeo Campolongo, using 10 red marble octagonal columns from the demolition of the original 14th century Chapel of Saint Anthony in the Santo. 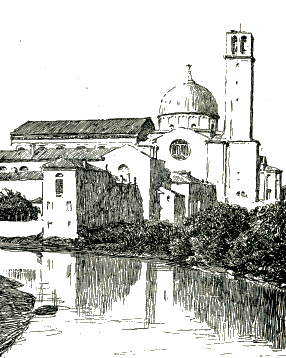 The church was part of a complex that included the convent of the Servites, the Oratory of St. Homobonus and the Oratory of the Guild of St. Mary of the Servites. Confiscated in 1806, the government only returned the church to ecclesiastical authorities in 1963, 157 years later, as a plaque in the church records. Aisleless and quite tall with white walls, a wooden corbelled roof and some unspecial monuments to worthies and a nice variety of 14th-16th century fresco fragments spaced around. The 16th century fresco of the Virgin and Child with Saints Roch Anthony Joachim and Anna on the back wall to the right is the most complete. It is now attributed to Dominico Campagnola (previously it was said to be by Girolama del Santo) and dated to the 1530s but looks to have suffered some inexpert touching up. The two frantic 17th century canvases above are by Matteo Ghidoni. The dominant feature is the very Baroque Altar of Our Lady of Sorrows which faces you as you enter the side door (see photo right). It is by Giovanni Bonazza from 1703-10 and houses a statue of The Madonna from the late 14th century by Rinaldo di Francia. It was previously erroneously attributed to Donatello. There's a small 'Scuola di Mantagna' Pieta fresco contained in a Lombardesque tabernacle to the right of the baroque altar, it was previously said to be by Jacopo da Montagnana, a Paduan painter who Vasari said studied with Bellini, but whose work indeed looks more influenced by Mantagna. It is now said to be by Pietro Calzetta (1430/40-1486) and is called The Man of Sorrows (Christo Passo) Between the Virgin and St John. There's also God the Father in the lunette above. There's a polygonal apse with two square side chapels. Flanking the apse are canvases of Saint Andrew and Saint Peter by Palma Giovane. The Carmelites were established around here, an area dominated by mills, in the later 13th century and work on their church here began in 1309, on the site of an oratory built in 1212. The original church had a single nave, a ship's-keel wooden roof and six chapels. In 1491 heavy snow and an earthquake caused the roof to collapse. Lorenzo da Bologna and Pietro Antonio degli Abati were employed to rebuild. The church was completed in 1523 by Biagio Biagio, the work retaining much of the original structure, with renaissance embellishments. (It is said that Lorenzo's dome is visible in Giorgione's Tempest.) Further damage, from an earthquake in 1695 (following which the roof was replaced and the façade, and main door were completed) and from fire following a firework display celebrating the new pope in 1800. Also bomb damage in 1917 by the Austrians (the dome was destroyed and rebuilt in 1931) and in 1944 by the Allies, the church being close to the railway station. Big, tall and aisleless, barrel-vaulted with six substantial chapels down each side, variously (mostly baroquely) filled. Fresco roundels, mostly, in the spandrels on the wall between them. A huge triumphal arch over the high altar at the end of a deep choir which has a large frescoed cupola above on a shallow drum, with a deep lunette arch over the arch. The choir area is covered in frescos of pre-raphaelite appearance. No transept. The painted altarpieces inside the chapels (the first and third on each side) and the panels elsewhere (large and square over each chapel and on the back wall) are mostly 17th century and not special. Many are by Bissoni and Varotari (aka Il Padovanino). The last altar on the right contains what is said to be one of the best by the latter: Christ with Zebedee's Mother, originally from church of San Giacomo. No labels on the art and no guidebook available. 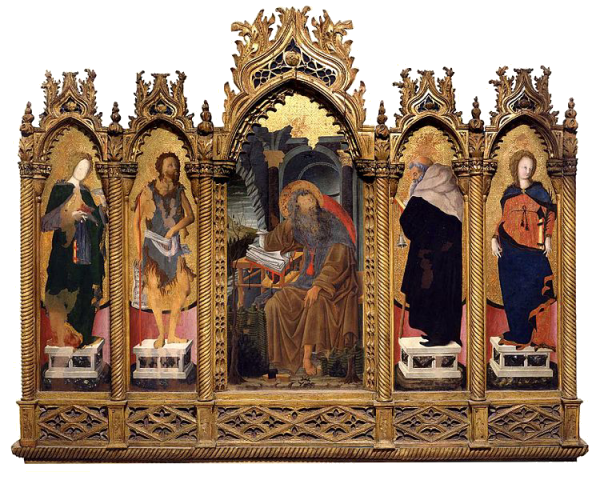 The Lazara polyptych (see right) by Francesco Squarcione, Mantegna's master, is now in the Padua Museo Civico. Contains a cycle of frescoes from the 16th century by Giulio and Domenico Campagnola, Girolamo Tessari and Stefano dall'Arzare. Following Napoleonic suppression the scuola became the parish baptistery and then a warehouse and storeroom. Following restoration it was opened to the public. The altarpiece here, a Madonna and Child, was formerly attributed to Titian but is now thought to be the work of Girolamo del Santo (a.k.a. 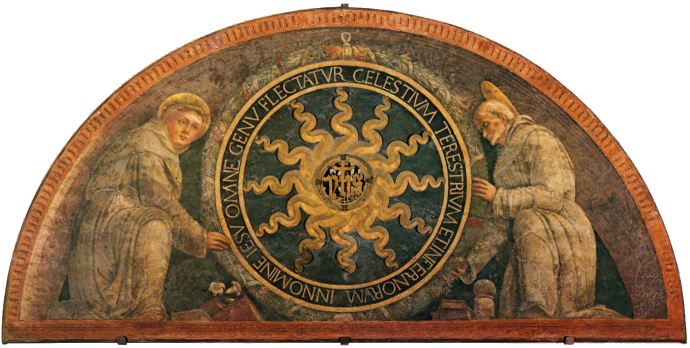 Girolamo Tessari) the painter also responsible for seven of the fourteen fresco panels here. The story, from Joachim Sent from the Temple to The Assumption, runs anti-clockwise from left of the altar. The left hand nave walls are the work of Giulio Campagnola 1505-7, (the first panel actually by his adopted son Domenico, a pupil of Titian). 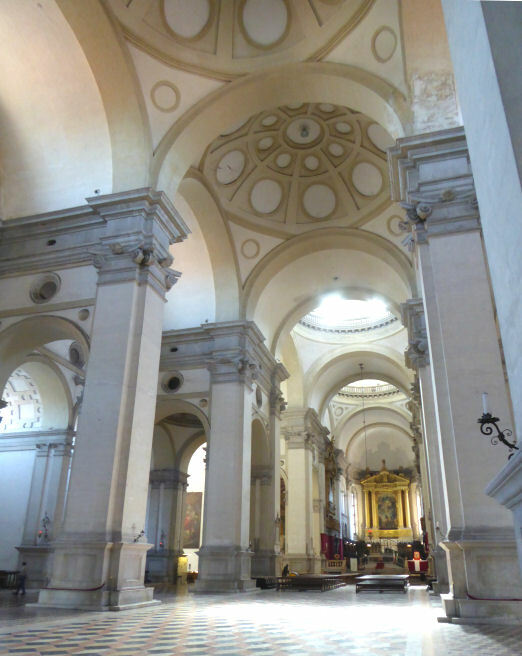 The right hand side of the nave and around the altar is work by Girolamo del Santo. The back wall's marvellously incorporated Nativity, Adoration of the Kings and the little Presentation at the Temple are by Stefano dell'Arzere, 1560. The stylistic transition from Giulio Campagnola to his son and Girolamo del Santo here supposedly illustrates the change in dominant influence from Mantegna to Titian, with Stefano dell'Arzere's work said to show the movement towards to mannerism. 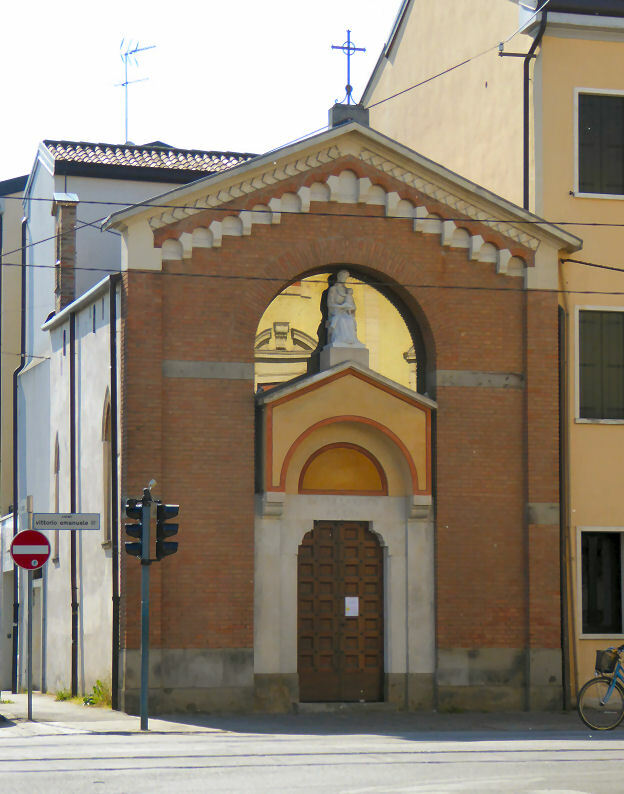 A small chapel dedicated to Santa Maria Annunziata stood here originally, at least since 1278, and a procession and mystery play celebrating the Annunciation was held here every 25th of March. 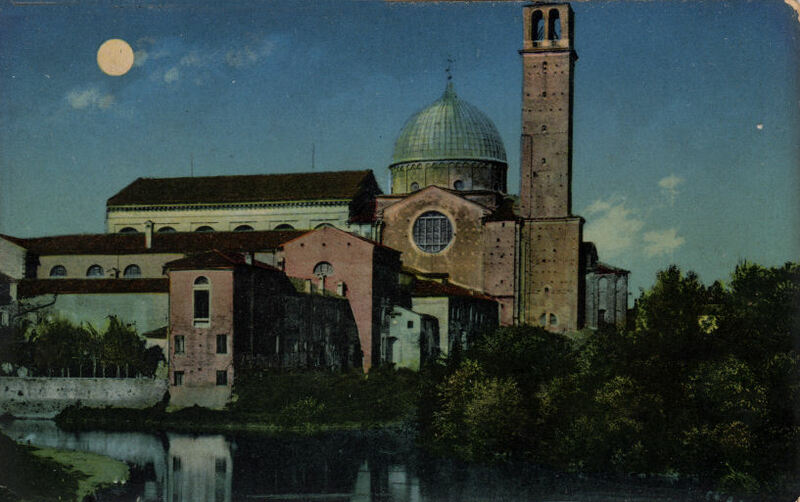 In 1300 banker Enrico Scrovegni bought from the Delsmanini family an enormous area of land which included the chapel and the eastern part of the Roman Arena, which was of a size and appearance to match the one in Verona. Scrovegni built a palace and rebuilt the chapel. It was dedicated to Santa Maria della Carità at the Feast of the Annunciation in 1303, when rebuilding began, and consecrated on 25th March 1305, and is now better known as the Arena Chapel and the Scrovegni Chapel. It was built next to a palace as a family oratory, but was also used for the long-established service during the Feast of the Annunciation. Enrico Scrovegni's fortune was derived from money lending, and usury was at the time thought to be a sin so grave as to exclude those guilty of it from the benefit of Christian sacraments. There is a widely held belief that Enrico built and changed the dedication of the chapel in penance for his father's sin of usury. His father, Reginaldo degli Scrovegni, was one of the usurers mentioned in Dante's Inferno - his arms (a blue sow on a white field) were placed in the Seventh Circle of Hell. (Dante and Giotto are said to have been friends, with Dante staying in Giotto's house.) Enrico's own tomb is in the apse. He died in exile in Venice in 1336, having been the victim of unscrupulous enemies, like Marsilio da Carrara, and having fled Padua. Giotto, the artist responsible for the chapel's frescoes, was also an architect and so it has recently been argued that he may have designed the chapel too. But it is also argued that the architect was Fra Giovanni Eremitano, who lived in the neighbouring Eremitani and is said to be the monk holding the model of the chapel with Enrico Scrovegni in Giotto's fresco of The Last Judgement on the entrance wall. The palace later passed to the Foscari family and was demolished in 1827, the chapel having also been slated for demolition two years later. 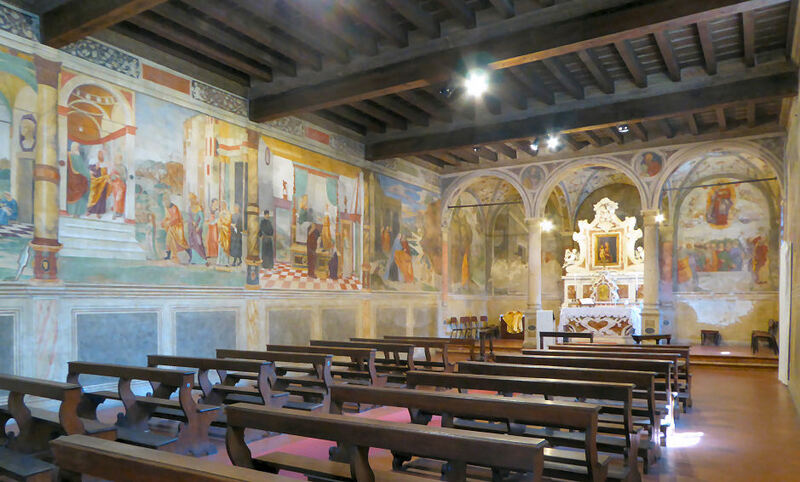 It is thought that, having been brought here by the Franciscans, to work in the Santo, after his work at Assisi, it was whilst working here that he met Enrico Scrovegni - he also frescoed a Scrovegni family chapel there - which led to his commission to decorate the Arena Chapel. It seems that Giotto and his workshop worked fast, as the decoration is thought to have been finished at the same time as the consecration in 1305. The chapel has a rectangular barrel-vaulted nave, six tall windows along the right-hand side and a three-light window high in the façade. The small chancel was finished later with fresco decoration by a a lesser Paduan painter. It is flanked by a pair of small side altars. 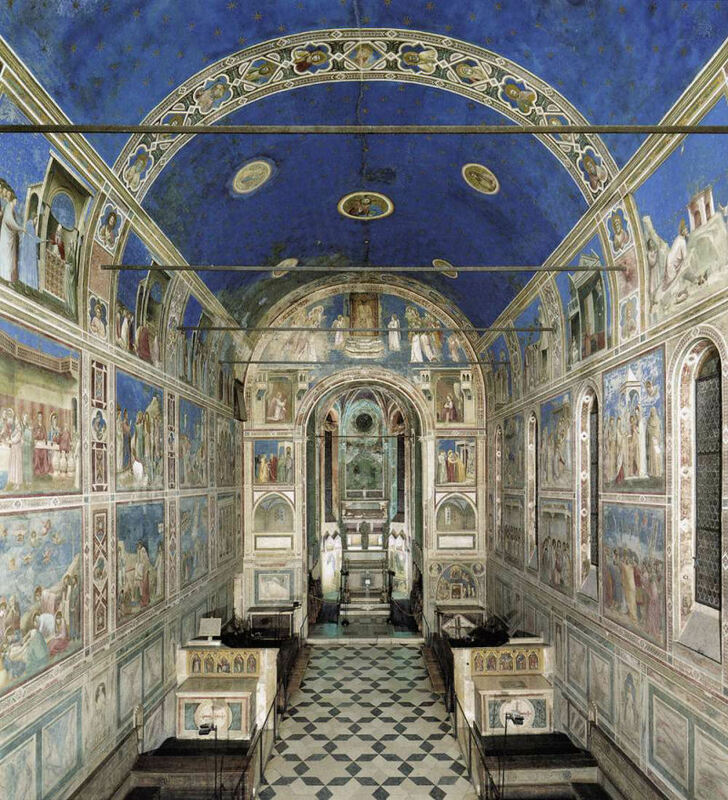 The interior space seems designed for decoration with frescoes, possibly on Giotto's advice, with a lack of architectural embellishment and windows facing south-east. 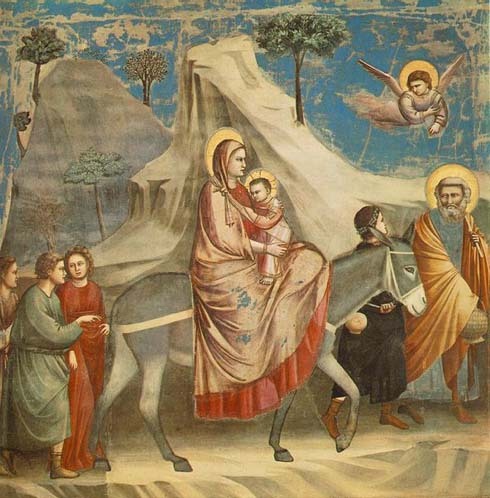 Giotto's frescoes here, painted c.1303-5, are unarguably his finest work, and certainly the best preserved. They are also one of the uncontested milestones of the formative years of the renaissance, although they were only really universally accepted as such in the 20th century, as the quote below from Ruskin illustrates. Their centuries of neglect were halted in 2002, when the chapel reopened after restoration. The vivid blue star-studded ceiling has painted medallions - Christ surrounded by four prophets (including John the Baptist) on the half nearest the altar; the Virgin and four more prophets nearest the entrance. The series depicting the life of the Virgin begins at the top left of the right-hand wall. By the time the series reaches the left hand wall it's into the life of Jesus. The drawing of Giotto is, of course, exceedingly faulty. His knowledge of the human figure is deficient. 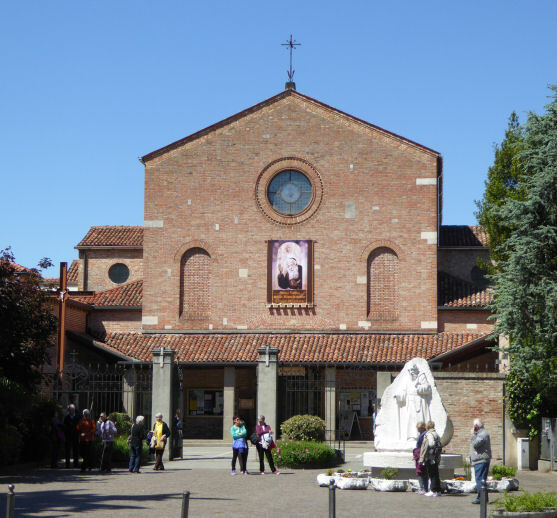 A painted Crucifix (see right) and a panel of God the Father, both by Giotto and painted for this chapel, are now in the Eremitani Civic Museum next door. 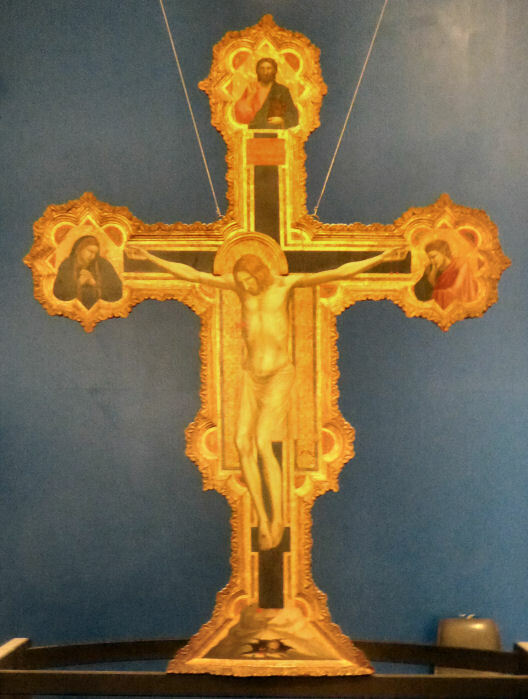 The Crucifix is signed by Giotto, is painted on both sides (the reverse being pretty ruined and featuring a painting of the Mystic Lamb and symbols of the Four Evangelists) and was probably painted at the same time as the frescoes. It may well have been placed on a screen between the nave and presbytery. It was restored in the early 1990s. You wait in an air-conditioned waiting-room watching a video for 15 minutes (to 'stabilise the interior microclimate') then enter the Chapel for a 15 minutes, so visits last about 30 minutes. 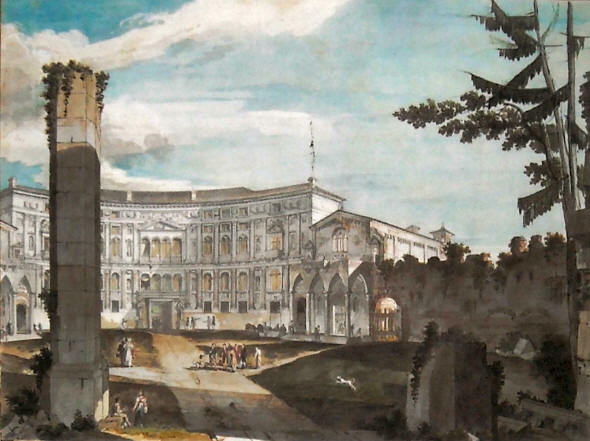 A mid-18th century watercolour by Marino Urbani showing the chapel (centre) when it was attached to the Scrovegni family palazzo, then known as the Palazzo Foscari. Built in 1436 at the expense of Domenico Campolongo, a Paduan nobleman, and enlarged in 1525. In the refectory here, a large Crucifixion by Michele da Verona dated 28th March 1505, itself a smaller version of a work of 1501 in San Giorgio in Braida in Verona, both commissioned by the Secular Canons of the Blessed Lorenzo Giustiniani. Impressive frescoes by Domenico Campagnola, a Paduan pupil of Titian. Two? 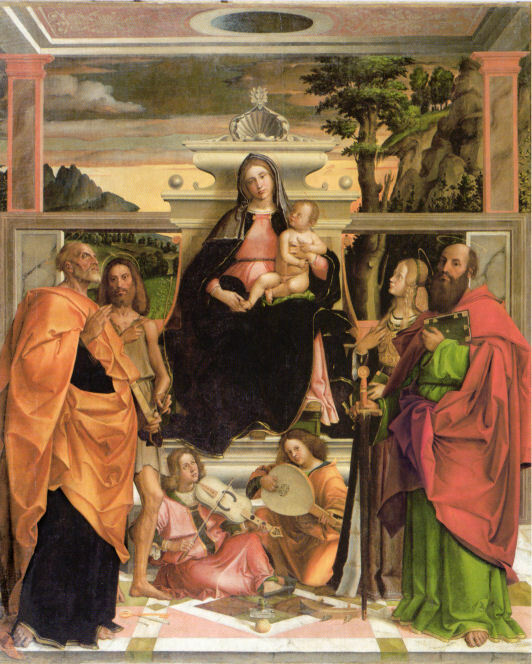 paintings by Bartolomeo Montagna, one being the Madonna and Child Enthroned, with Saints Peter, John the Baptist, Catherine, Paul and Angel Musicians (c.1512) over the high altar (see left) which was restored in 2002. It also has wings depicting Saints Lawrence and Francis. An Entombment, signed by Jacopo Bassano and dated 1574 on the stone, bottom centre, over the last altar on the left wall. Built in 1723, by Comini family, but probably with worker participation, perhaps local boatmen. The sober body of the church contrasts quite a bit with the (rare in Padua) rococo campanile. Restored with funds from the Lion Club in 1968, as the plaque on the wall by the door tells us. 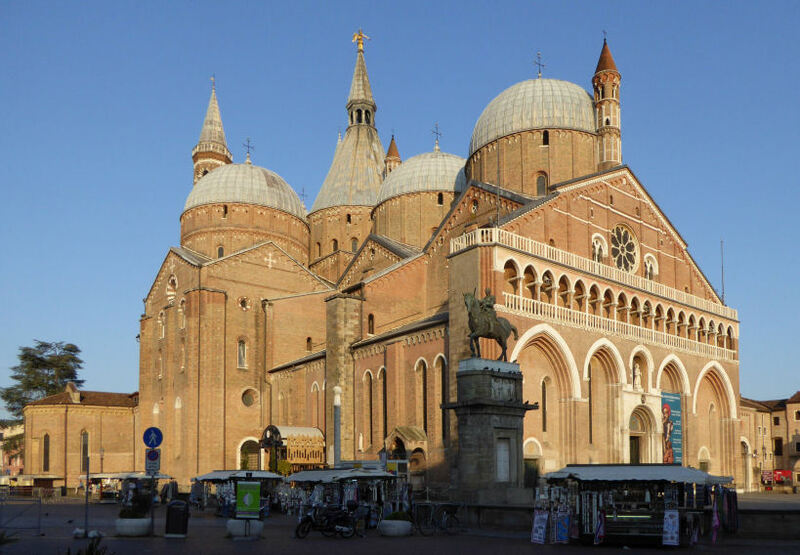 Various traditions have it that this is the site of the oldest church in Padua, built by St Prosdocimus himself, or that it was founded in the 8th or 9th century, on the site of a temple to Mithras, and that it was the original cathedral of Padua. It was crumbling in 1106, though, and the current church was built as a consequence of an earthquake in 1117, having been completed in 1127 with a Romanesque facade but retaining the earlier church's apse. There were 14th century Gothic additions too, and much restoration, including the removal of a building which was 'leaning on it' in the 1950s. 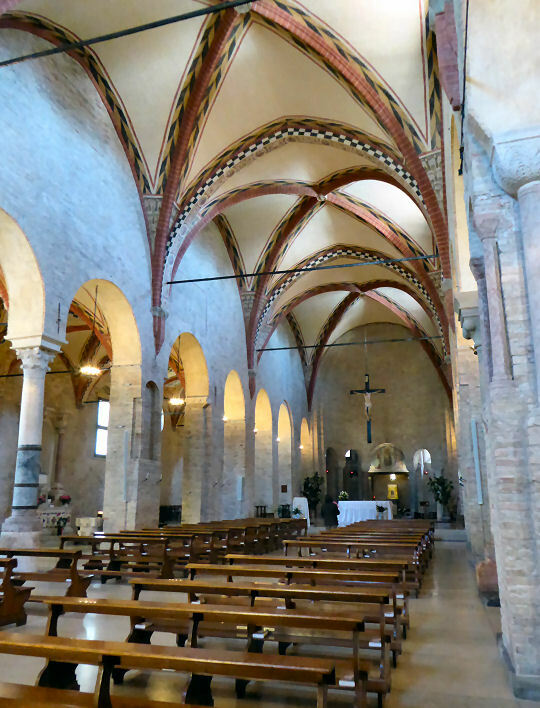 Pale brick and plain, with a nave and two aisles separated by rows of pillars, columns on pillars, and two columns - they vary much but match across the nave. A groin-vaulted ceiling of the 14th century, with decorated ribs and arches. Two side altars each side. The deep apse has an ambulatory which narrows to nothing at the back. A burst of fresco in the vaults over the left-hand aisle of the ambulatory. Some 13th/14th-century anonymous frescoes and traces, including a 14th-century lunette of the Madonna and Child Enthroned with Saints and Donors over the apse (see photo below) . A Vision of San Francesco di Paola by the Paduan artist Giovanni Battista Cromer (1665 - 1745) was restored in 2002. An altarpiece, painted for the high altar in this church in 1448 by Mantegna. It is said to have been his first commission and according to Vasari was painted when he was 17. It is now lost. Built on the site of a large burial ground, it is said, the church here became a parish church in 1308. San Massimo was the second bishop of Padua. 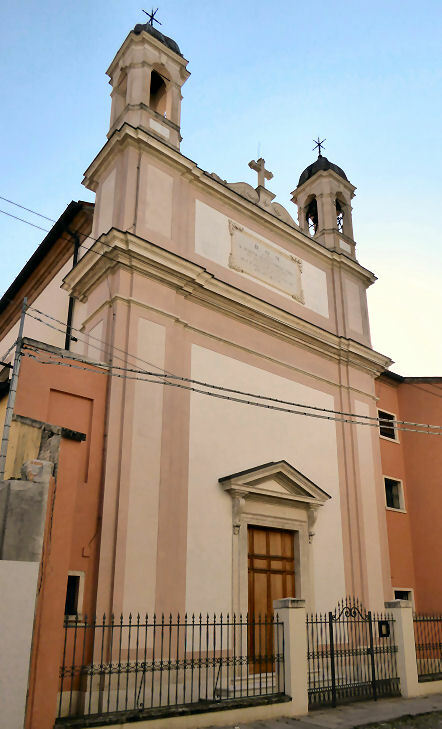 The small medieval church underwent rebuilding in the 16th and 17th centuries, due to the popularity of the are for patrician family houses and to a charismatic parish priest, Father Giuseppe Cogolo, to who commissioned paintings by Giovanbattista Tiepolo between 1742 and 1745. Parish church status was lost during the Napoleonic suppressions and the church was closed to worship. During World War II it suffered bomb damage. It reopened as a university chapel after a major restoration in the 1990s, although it suffered much loss of fittings during its years of closure. Three altarpieces by Giambattista Tiepolo - St John the Baptist, The Flight into Egypt and the titular saints. Also the tomb of the famous physician Giovan Battista Morgagni. Santo Rosario Madonna della Salute? 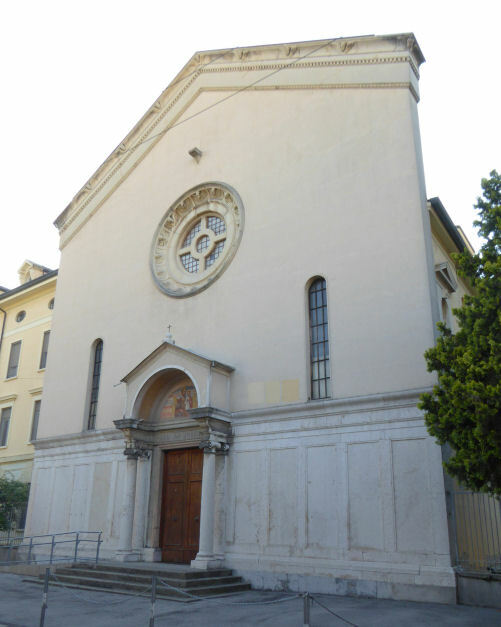 North of the town is the Sanctuary dell'Arcella, a Gothic Revival church, completed in 1931,to designs by Eugenio Maestri, built on the site of a hospice, run by Clarissan nuns, which had been established by Saint Francis of Assisi himself in 1227. At this time the hospice was some distance outside the city walls. It was here that Saint Anthony died on the evening of June 13, 1231. Still run by Conventual Franciscans, and now a parish church. Church and Monastery of the Capuchin Friars aka The Sanctuary of Saint Leopold Mandic, which houses the remains and the confessional cell of the beloved Dalmatian Capuchin saint who died in 1942 and was canonised in 1983. The church is in the centre, to the right of the portico is the Capuchin monastery and to the left the saint's confessional cell. They were rebuilt from 1945 to 1948, following the destruction of the church and part of the monastery during an air raid on the 14th of May 1944. The saint's cell was miraculously undamaged, as predicted by him, it is said. His remains were moved from the town cemetery to a funeral chapel beside his confessional. The relic of his right (blessing) hand is displayed in a niche by his tomb. Jacopo Bellini was commissioned in 1430 to paint a fresco of the Archangel Michael for the church of San Michele in Padua. Two panels by Lazzaro Bastiani depicting the Archangels Michael and Gabriel are said to be the organ doors from the church of San Michele. Founded in 1226 by Dominicans on the west bank of the Bacchiglione River. A small oratory already on the site, dedicated to Santa Maria di Valverde served as a chapel initially. The new large brick church was consecrated in 1303. Twelve trachite columns separated the nave from the aisles, and there were nineteen altars, which would eventually be topped by altarpieces of the 16th/17th centuries. There was a Donatello Crucifix, a polychrome terracotta Pietà by Giovanni Minello and works by Antonio Bonazza and Tommaso Allio. Suppressed in 1806 and demolished by the Austrians in 1819. All that remains is one of the two cloisters - it became a barracks and looks ruined, but still in use. The refectory of the barracks evidently still has a fresco fragment of a Dead Christ with Two Angels attributed to Guariento. The tombs of Jacopo II da Carrara and Ubertino da Carrara by Andrioli di Santi (now in the Eremitani church) were originally sited in the presbytery here, along with the fresco of Coronation of the Virgin with the two Carrara princes, by Guariento. 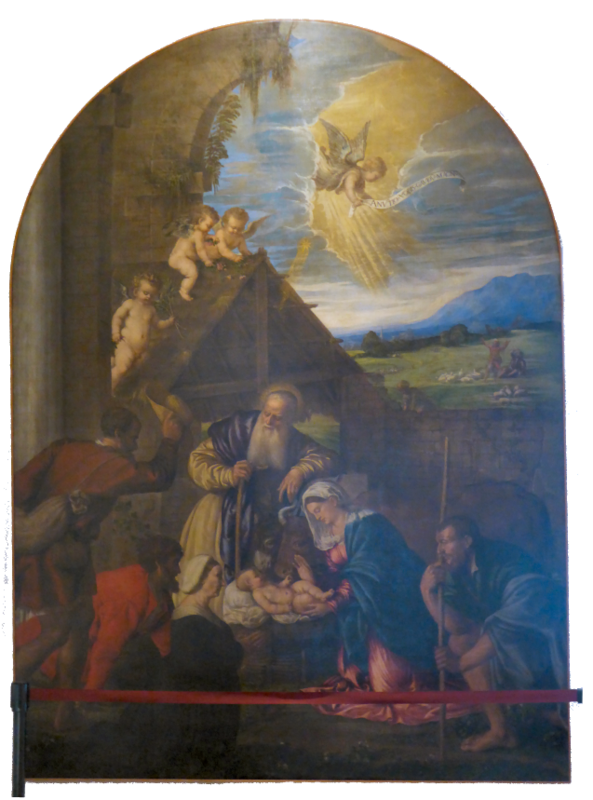 An Adoration of the Shepherds with a Donor by Stefano dell'Azare (see right) is now in the Eremitani Civic Museum. As is the Resurrection of Christ with Mary Magdalene and Saints Augustine, Dominic and Andrew by Domenico Campagnola, and studio.